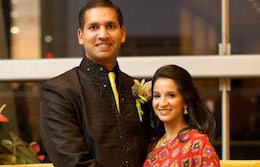 Rachana and Vijay - Sonal J. Shah Event Consultants, LLC. I want to thank you for all your hard work to help create the wedding of my dreams. I wasn’t sure if what I envisioned would be accomplished and because of your dedication to finding amazing vendors, planning intricate details and generating new ideas I was able to get not only what I hoped for but so much more. I was nervous as I had a very tough crowd to please with so many of the invited guests having attended extravagent affairs before. Now, I continue to receive phone calls from friends and family referring to our wedding weekend as ‘a bollywood affair’. None of this would have been possible if had not been for your company. Sonal always told me from day 1 that the key to a great event is a detail-oriented attitude as well as being open to new thoughts on how to make an event different…and that is exactly what you provided us. No detail was left to chance and the timeliness of all events was impeccable. Again, thank you so much for your help. I will never forget how wonderful everything was and I will always remember the smartest decision I made in all of this wedding planning process was choosing your company to make my dreams come true.